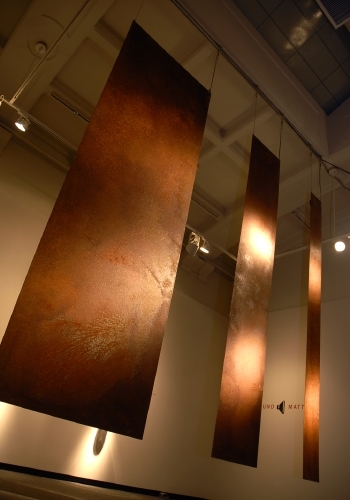 Five large, sound-producing metal plates of differing widths are suspended from the ceiling. Viewers/listeners move freely around and between the plates to experience a constantly changing sonic and visual environment. Sound from each plate is transmitted electronically to a computer, which in turn processes and returns the signal to the plate. The sound heard from each plate is a combination of the resonant characteristics of the plate and the computer processing of the electronic signal.